Retail investors are to blame for bidding up Canadian pot stock Tilray, CNBC's Jim Cramer says. There's nothing in terms of company fundamentals or industry trends to justify the move, he argues. 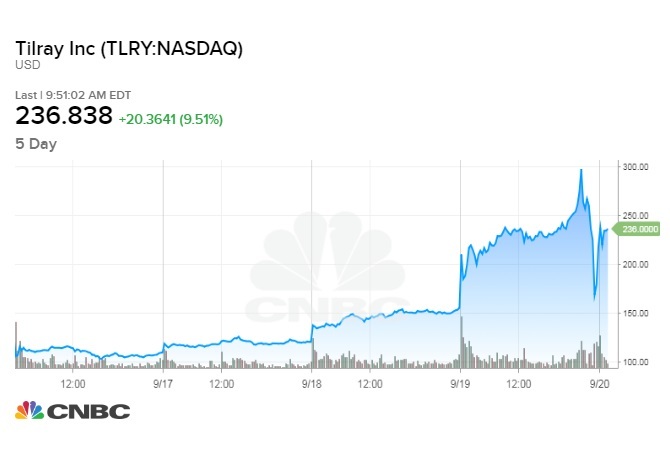 Shares of Tilray surged again Thursday after Wednesday's wild ride that ended with a gain of 38 percent. Retail investors are to blame for bidding up Canadian pot stock Tilray to dizzying heights, CNBC's Jim Cramer said Thursday. There's nothing in terms of company fundamentals or industry trends to justify the move, he contended. "I would love to say don't buy Tilray," Cramer said on "Squawk on the Street." "Please don't buy it." "You're going to make some money, maybe short term," he added, suggesting the risk is not worth it. The promise of the marijuana industry cannot compare to what the internet had to offer during the 1990s dot-com boom and bust, Cramer said on "Squawk on the Street." "But the investors [now] are trading like the dot-com." Cramer, host of "Mad Money," warned Tilray is not a stock that investors should try to bet against by going short. Shares of Tilray surged again in early trading Thursday on Wall Street and then turned lower midmorning. During the regular trading day Wednesday, the stock was halted five times by the Nasdaq, rising as much as 90 percent and briefly turning negative, before closing up 38 percent. Tilray CEO Brendan Kennedy told Cramer on Tuesday that global pharmaceuticals must think about partnering with cannabis producers as a "hedge" against the burgeoning marijuana industry. On Thursday, Cramer stressed that Kennedy, during the interview, was not being promotional or trying to talk up the stock. Cramer reminded investors that legalization of recreational marijuana in Canada won't happen until October. Only nine states in the U.S. and the District of Columbia have legalized cannabis for recreational use. Tilray did not immediately respond to CNBC's request for comment on Cramer's remarks. — CNBC's Matthew J. Belvedere and Fred Imbert contributed to this report.